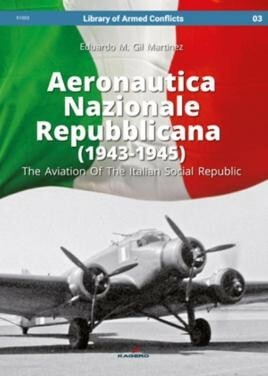 Continuing with the study of the little known Air Forces that fought in the skies of Europe during World War II, in this book we commemorate the Italian Air Force that after the Armistice in 1943 remained under the command of Benito Mussolini and a German ally: the Aeronautica Nazionale Repubblicana (ANR). At the time, two different Italian Air Forces were fighting in the Mediterranean Theatre of Operations, although they never fought each other. Fortunately, several works by Italian (and some non-Italian) authors saved the ANR from oblivion. The works written by D´Amico, Valentini, Di Terlizzi, Garello, Arena, Neulen, Beale, Gentili, etc. have provided a wealth of information on the subject. This book aims to provide a comprehensive history of the ANR since its creation to the end of World War II, focusing not only on its air force but also on ground forces. Therefore, the book draws on a wide variety of different sources. Aeronautica Nazionale Repubblicana (1943-1945) represents a tribute to all the members of the Aeronautica Nazionale Repubblicana that fought in the Second World War. For the enthusiast, an excellent book and good value for money...Recommended. If you're interested in the lesser known Air Forces, or the WWII Axis, this is an interesting book that should give you some hours of entertainment, and remain on hand as a reference for the modeller or historian. This is now the third of the "Library of Armed Conflicts" books I have reviewed and it is turning out to be a good series...Highly Recommended. Today's book is a must-have for all WW2 history fans and those who plan to work on Italian aircraft in whichever scale.